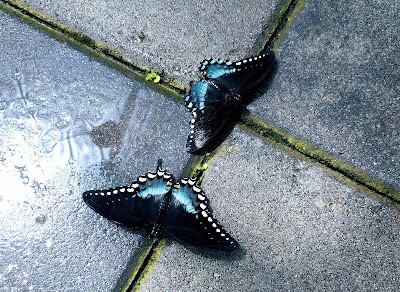 Pipevine Swallowtails having a drink of water. At the exhibit yesterday, I was able to practice a bit of German with a family visiting from Switzerland. Knowing that standard German is also a foreign language for them somehow takes the pressure off of speaking correctly, and I find myself doing mostly just that in conversation. The father was native Swiss, the mother was Dutch, but has a facility with languages. She said that her passive understanding of Swiss German came in only a few months' time. Speaking followed soon after. I can see why that would be given that those from Holland are taught foreign languages at an early age and, in my experience, are basically bilingual in English and Dutch from the get go. We chatted a bit longer auf Deutsch, then I gave the family a bit of tourist information regarding Golden Gate Park before wishing them a schöne Reise noch! One chick, however, claimed that I had 'hurt her soul' because she felt unfairly treated. She'd come into the exhibit with a flower pinched from the main building with the intent of luring butterflies to her hand. I told her that the butterfly room was a self-contained environment, and that nothing was to be either brought in or taken out. At my request, she put the flower in her pocket. Then, she then leaned over an area of shrubbery, sticking her face near the flowers. A butterfly landed on her hand. I told her that butterflies don't do well with the oils in our skin, and that I would remove the butterfly from her (using my trusty tongue depressor). She was not happy, tried to turn her body even farther away from me while saying 'can't you just let me have my moment?' I again explained how butterflies source their food using receptors in their feet and that we would, in essence, be denying them finding sustenance if we were to handle them. And, frankly, although I didn't tell this to her, if I were to let everyone have 'their moment' with the butterflies, the place would quickly become a petting zoo. She didn't seem to fully take in what I had said, but she stopped, sort of, trying to get butterflies to land on her. She instead took to sticking her face really, really close to any and all resting butterflies. At one point, she seemed to be trying to give a butterfly air 'butterfly kisses'. Her behavior was odd, but I let her be. As it turned out, she'd come to the exhibit with her, I think, grandparents. She was probably in her twenties and they were in their late 60s, if I could guess. The grandparents were completely hands-off with respect to the self-pronounced Butterfly Whisperer. In fact, I didn't cotton onto the fact that they were all together until a White Peacock landed on grandma's head & I mentioned that it looked like a beautiful hair clip & that it would make a lovely photo. The Whisperer came close, murmured something at grandma then turned back to the mesh wall. The grandparents left the exhibit at around the 20 minute mark, 'hurt my soul' stayed even longer, her face up moving along the mesh walls and pressing into the bushes. Once her family left, she approached me to tell me that 'human to human' I had upset her. She had observed my speaking to another visitor, who'd had a butterfly alight on his hand, in a way that she deemed less confrontational, and would have preferred I had treated her in kind. To be fair, this other person did not present himself in a way that indicated he would be a problem. Again, I did not tell her this, but instead apologized as best I could for hurting her feelings while wishing she'd just go away. Eventually, she did. 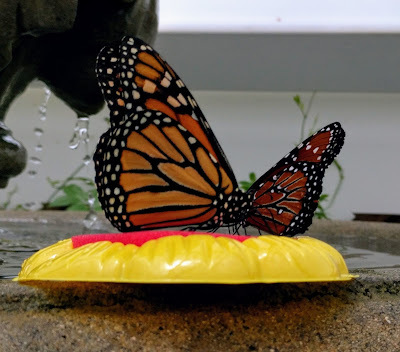 Monarch and Queen, same genus, having a snack. We do seem to breed rather a lot of 'precious' self-important souls. I admire your patience, which I am not sure I could manage. I'll admit, I could feel myself getting a bit tetchy when she persisted in telling me how I had hurt her feelings. She really wanted me to capitulate, and, in the spirit of keeping the mood in the exhibit light, I did. When I told my work colleague, who'd been absent at the time of the interaction, about the incident he said, 'I think I know how that was'. And, guess what? He was right! Hi, from Idaho and found your blog though AM...Butterflies are sure pretty. Bea, I would have been taken aback. "Hurt her soul?" Wow. I've seen butterflies near the pond at the farm, drinking turtle's tears. Eeek. She sounds a little too precious. Can you deny entrance to people who continue to be a problem? I'll have to check with the daily, paid staff about that sort of thing!